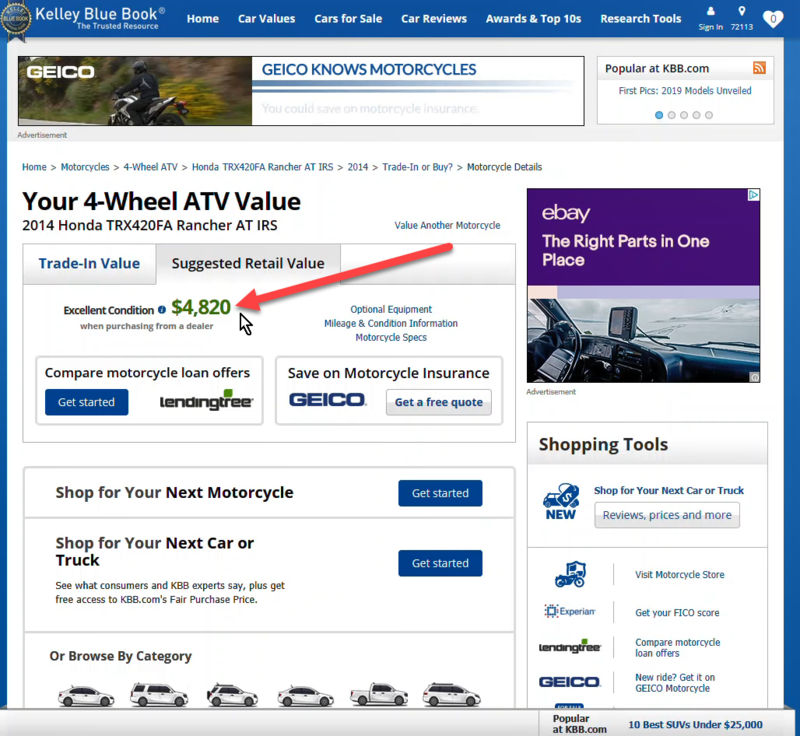 4 Wheeler Blue Book Values for ATVs. 4 Wheeler Blue Book Values. Need to know a 4 wheeler Blue Book price? We've put together some shortcuts and tips to find those used four wheeler prices faster and easier. 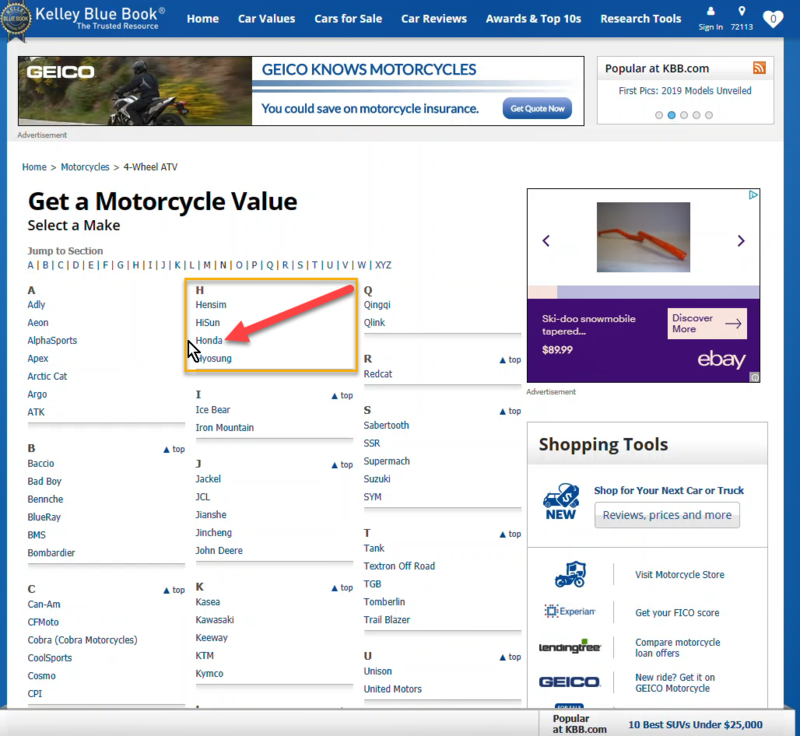 How to Use the Kelly Blue Book to Find Used ATV Values. Kelly 4 Wheeler Blue Book ATV Values. - Just click the link to eliminate several steps. Get this page up and then follow our step by step instructions to get the true value of a used 4 wheeler. 1. - Type in your zip code when prompted. This makes sure your four wheeler blue book price is accurate for your area. 2. - The next page lists manufacturers in alphabetical order. Click on the maker of the ATV. 3. - On the next page you'll pick the model year you want to see. 5. - Choose Retail for the price a dealer would ask for a 4 wheeler in excellent condition on the showroom floor. 6. - Choose trade-in value for the price a dealer would normally offer on a four wheeler being traded in on a new model. 7. - The next page shows you the price for that model. 8. - Click on the "optional equipment" link for more options. 9. - On the Additional Equipment page - look for the Off-road and ATV category. You'll see popular options listed with their value by year model. 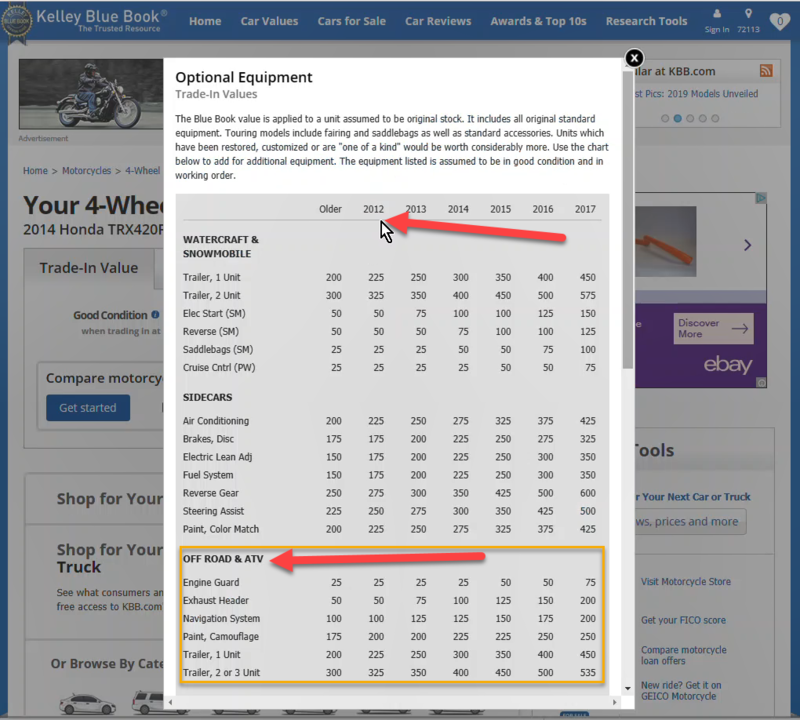 Add up the options and then total them with the 4 wheeler blue book value from the previous page. That will be your final price. 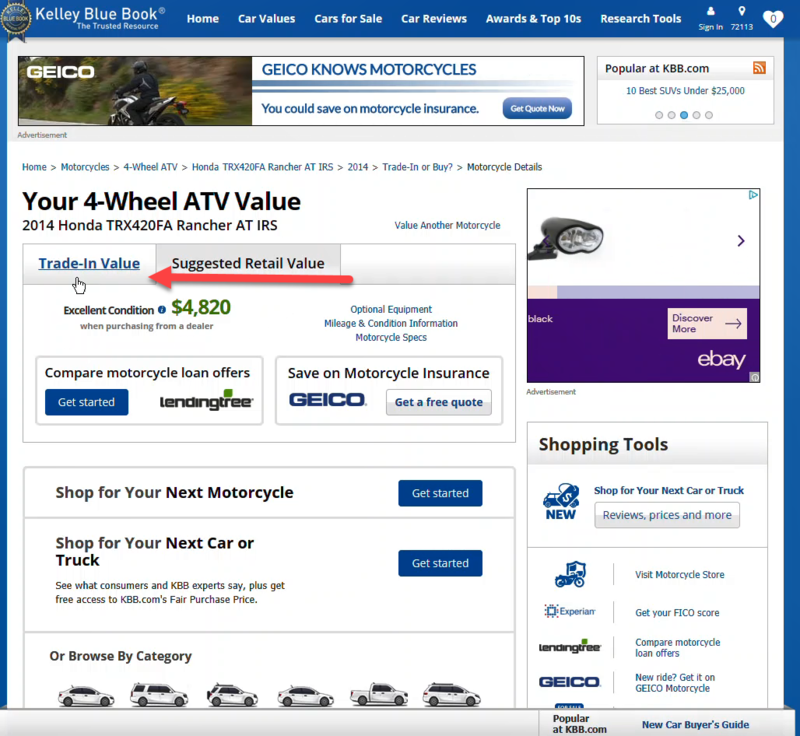 Final Tip - Remember when it comes to four wheeler blue book prices that the trade-in value represents the lowest price while the retail value would be the highest. These guides are compiled for the dealer's so I would regard any of the prices shown as only a starting point. Free Guide to ATV Blue Book Prices. How to find the latest ATV values. 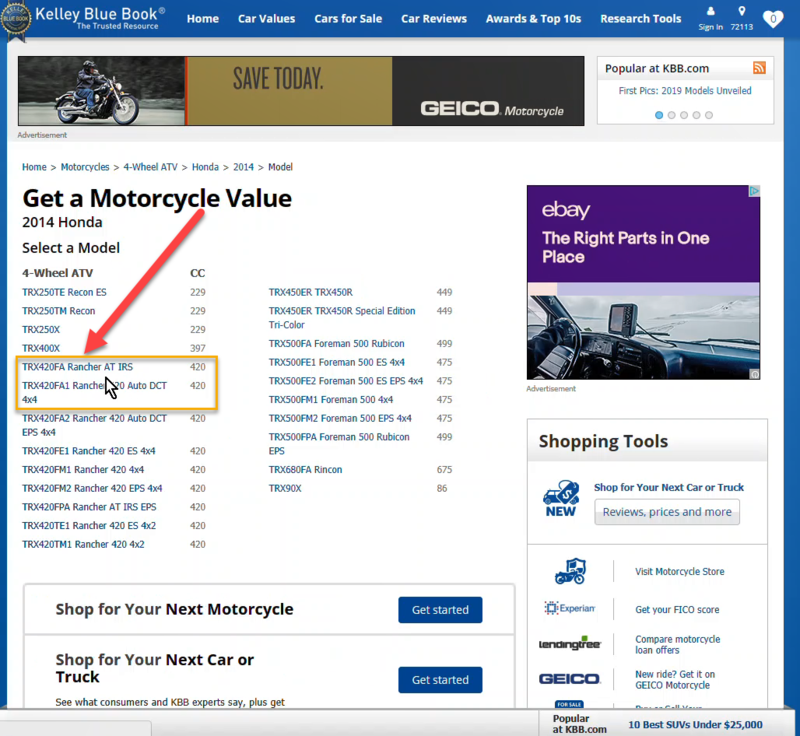 Free ATV Blue Book Value Guide with step-by-step instructions. Find what your ATV is worth. 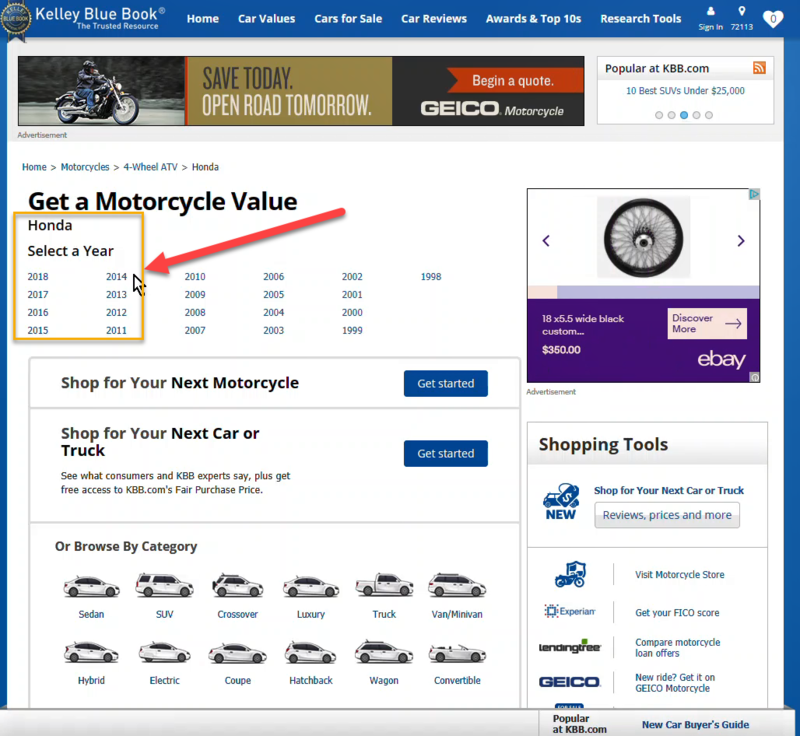 Kelly Blue Book ATV Values. Tips for finding current ATV prices. ATV Kelly Blue Book. 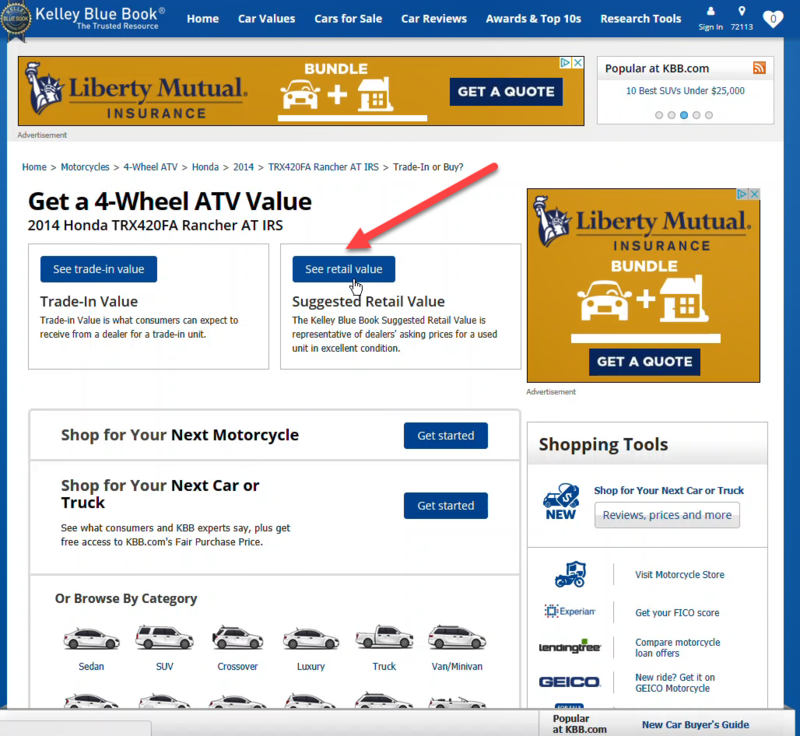 Step by step instructions for using the ATV Kelly Blue Book to find the real value of your 4 wheelers. The ATV Blue Book Guide. 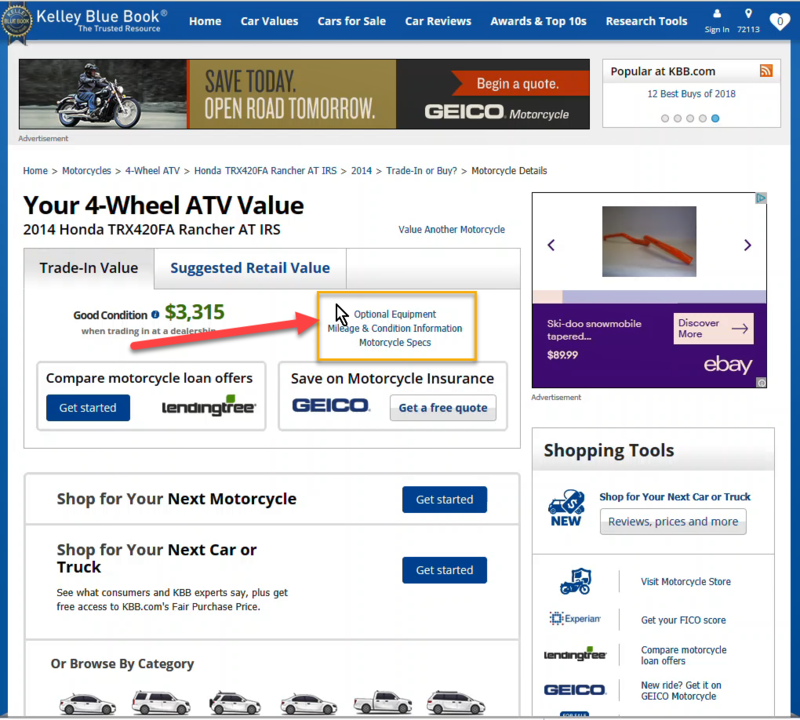 How to find current trade-in and retail prices for used ATVs.